Wow, it is already Friday!! This week went super fast, and I think it was because of my summer class! It is pretty boring, but I'm already a third of the way done! So today I am linking up with Amanda at The Teaching Thief for her Fiction Friday linky! Do you teach about figurative language, idioms, or figures of speech? Well, then you are in luck, because I have a book for you! More Parts, written by Tedd Arnold, is about a little boy who is absolutely BOGGLED by the crazy things that adults say! For example, when his dad asks his son to "please give him a hand," the little boy gets super paranoid and glues gloves onto his hands - just to make sure they stay on, of course. This book is very funny and cute, and it would be a great addition to any mini-lessons on figurative language! As an extension activity, you might want to have students choose a specific idiom and illustrate both what it sounds like it means literally and then what it actually means. It could be a cute display of learning and would increase your students' vocabularies for sure! I recently just finished a fantastic chapter book - The Mighty Miss Malone by the amazing Christopher Paul Curtis. Do you love him as much as I do?? 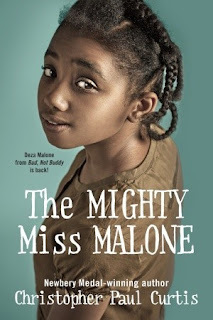 The Mighty Miss Malone is sort of a companion book to Bud, Not Buddy - but it's not imperative that you read that book first. This is the story of Deza Malone, an 11-year-old girl living in Gary, Indiana during the Great Depression. While reading this book, I was reminded of how incredibly difficult the Depression was and I learned how it affected children and morale overall. It was also really interesting (and, of course, heartbreaking) how race relations were so different in cities like Gary compared to Flint, Michigan. You could use this as a general read-aloud, as a vehicle to discuss character traits, or as a supplemental text if you teach about the Great Depression. Students might enjoy hearing the story because they can relate to Deza and can imagine themselves in her tattered shoes. The author's note at the end of this story was especially sad when he pointed out how many American children live in poverty every day. He wants Deza to be a face for child poverty so people want to take a stand against it. How can you argue with that? Thanks for the book suggestion...I am looping up to 5th grade with my 4th graders for last year and we teach the Great Depression. I am going to pick up a copy of this book and read it so I can do a read aloud with them during our unit on the Great Depression. Thanks again! Hi Jill! More Parts sounds too cute. I have the first book in the series, but I love the idea of using it to idioms (something my 4th graders could use a little work with). I'm definitely snagging that great idea! The Mighty Miss Malone sounds powerful! I love Christopher Paul Curtis too! Thanks for linking up and sharing these great books! I'm so glad you mentioned More Parts. I have all three books (Parts, More Parts, and Even More Parts). The kids just love them! I finished reading The 19th Wife. I am now trying Unbroken. It was a page turner at first, but now it's starting to slow down and I'm having a harder time with it. Anyhow, I'm passing on the One Lovely Blog award to you. Stop by my blog to learn more about it. I'm going to purchase the Parts books. I have never heard of them. I’m your newest follower. Please check out my blog if you get a chance. Calling Plays in 2nd Grade.